A lively bird with an expressive crest, this species combines strong coloring with a bold, assertive manner. It is common in areas of grassland mixed with scattered trees and shrubbery, often near water. It is usually seen in pairs or small groups, feeding on a variety of seeds on the ground. Its rich, melodious song makes it a popular cage bird. • NliST A neat, cup-shaped nest made of rootlets and grass, placed low in a bush or a small tree. • DISTRIBUTION p.. Bolivia, Paraguay, Uruguay, S. Brazil, and N. Argentina. Introduced population in Hawaiian Islands. I he stiff, gold-colored feathers on the front of this bird's crown give the spccies its name. It is usually seen in pairs or in mixed feeding flocks, taking insects and some-plant material. Feeding in the lower and middle levels of the forest. Plush-capped Finches use their strong, stubby bills to probe into the leaf-tufts of South American bamboos in search of food. 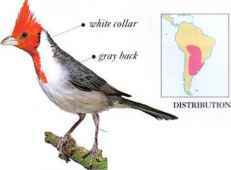 • DISTRIBUTION Andes from N. Venezuela to N. Argentina. 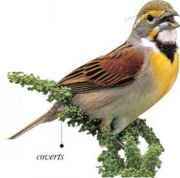 Named after the sound of its song, the Dickcissel is a sparrowlike seed-eater of open grassland. It is gregarious, especially on migration, when enormous flocks are seen. 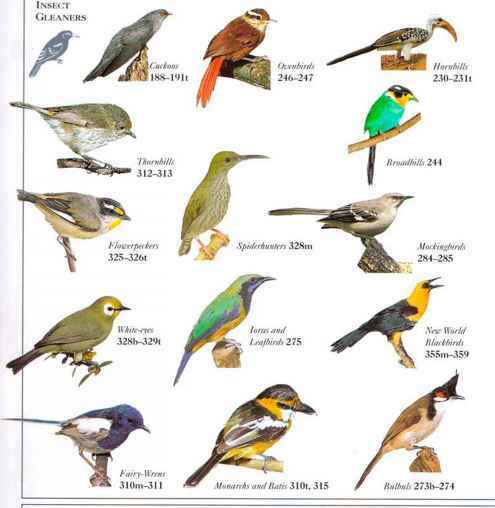 Dickcisscls feed on the ground on a variety of seeds and insects. • NliST A bulky cup of plant materials situated in a shrub or a grass clump. • DISTRIBUTION Breeds in C. Canada and r^ ■ _ in interior and E. USA. ' chrmu' Winters from S. Mexico m. to N. South America.